These were a great addition to our tree. They looked like real icicles!! Though they are very delicate, so be care when handling. I would definitely recommend this product. Decorate your home this holiday season with these gorgeous glass icicle ornaments. Each of these icicles is handcrafted from recycled glass by talented artisans in the mountains of Pakistan and India. The purchase of these icicles helps the people of this region to sustain their community, making this the perfect purchase for the season of giving. Story Behind the Art: This product was created in a region near the Pakistan and Indian border. When the British removed its armed forces from the region in the late 40's, a majority of the industries in the local economy went with them. The indigenous people returned to the traditional crafts that they had known for generations. Several hub cities of industry have flourished, creating numerous sustainable and stable jobs for the people of the surrounding villages, helping to sustain people between harsh growing seasons. The industry offers people, especially women in this area, a valuable means of providing for families. This industry has created an unprecedented number of schools, hospitals, and improvements in the infrastructure of the area. This industry has truly created a renaissance of economic growth in the region. Dimensions 13.0 In. X 7.0 In. X .25 In. I have three sets of these, and have used all of them the last two years on my 9 foot tree. Everyone that sees them comments on how beautiful they are. They add so much sparkle, and an unexpected touch. This year I plan to hang some of them from the ceiling in my foyer with fishing line. They look delicate, but are remarkably durable when dropped. I do suggest that you count them before putting them on the tree, and again when taking them off to make sure you get them all off. I have lost three due to breakage when they were left on the tree at the end of the season. The package is great for storing them, but you may want to take a photo prior to removing them from the pierced plastic holder inside the box, as it is tricking fitting them all back in. Update 12/3/2017 - Then years later, I still use these every year on my tree and/or hanging from the ceiling or from the top frame of a large entry mirror. Everyone who sees them comments on how beautiful they are, and asks where I got them. They are remarkable durable. I have dropped a few over the years (carpet, rug, tile), and have only had one break (that was the tile - glass vs ceramic tile - tile won. No breakage during storage in the original boxes; they are thick-sided, and very strong. I still recommend taking a pic of the placement inside the box before removing them for use. If you don't it takes MUCH longer to figure out which ones go where so they all fit. I'm thinking about tracing them on the bottom of the box while packed, so I can see the length after I put them back into the box this year. I ordered these for my mother - and I had to do a double take when I opened up the box! They look so much liek real icicles. There are six 3-inch, five 5-inch, four 7-inch, three 9-inch and 2 11-inch oranments. Very nice! Before I purchased this product, I practically every review posted on this site. When I got my order, I was very pleased immediately. I bought 2 boxes and nothing was broken, the packaging was great and did not smell like a lot of people said. I have a 7 foot tree and used 2 boxes. It made my tree look amazing. Many people mentioned that they are kind of flat, but I could not tell at all once it was on the tree. I cannot say enough good things about this. I would never buy the plastic icicles, or even glass that was twisted. This was perfect. I bought 4 sets, one for me, the rest for gifts. They are beautiful, look like real icicles hanging on the tree. It is also nice to know I am helping people in a viillage in India with this purchase. These icicles are absolutely gorgeous. I ordered two boxes for our Christmas tree, and recently ordered a third box, I was so pleased with the product. Getting a variety of sizes was a great deal, especially the 11-inch icicles. With white lights on the tree, the effect is magical. The heavy duty storage box the icicles came in is quite handsome; a real bonus. Many customers have replaced the copper wires that come with the icicles with monofilament line, but I actually liked the copper wires. They are easy to thread and tie, and completely disappear against the tree's foliage. All in all, a wonderful product and excellent buy. Who knows: I may be back for a fourth box! These recycled glass icicle ornaments look beautiful on my tree. I plan to purchase more for the upcoming holiday season. Friends of mine, after seeing my tree, have purchased these glass icicle ornaments. Prior to my purchase I would decorate my tree using plastic icicles. There is absolutely no comparison! This ornaments created a shimmery and beautiful effect on my Christmas tree. I will use them for years to come. Nicest Icicle Ornaments I've ever owned! I've had quite a few different Icicle Ornaments over the years (some high end crystal) and none of them have measured up to how nice and REALISTIC these ones are. If you're looking for HIGH QUALITY ornaments that are very realistic looking -- you've gotta get these! I ordered 2 sets for an 8 foot tree, and needed to order one more set -- so 3 sets for an 8 foot tree is perfect! I initially bought these for my tree but so many people have admired them that I have bought several sets for other people as well. They are very realistic, beautiful and priced quite reasonably. Absolutely beautiful and natural looking! I have never seen anything like that before, only on the edge of the roof in my house! :) One box is enough to add tenderness and charm to 8-feet tree. Very happy with the purchase and once again with Overstock! I've been collecting glass icicles for years. We have approximately 300 on our Christmas Tree. These are by far the most realistic looking. I'm so pleased. Between cats and children, we often lose some icicles to breakage each year. I'll be ordering these as replacements as long as they are available. The icicles are beautiful. I ordered 2 sets and have just ordered a 3rd. They are very realistic. The set contained copper wires for hanging, I will probably use fishing line instead. These ornaments really look beautiful as they glisten among the lights on our tree. Quality construction. I've considered purchasing more of these for Christmas gifts. I stalked these icicles for quite a while before buying a bunch of them. Wow, they look like real icicles; great variation of size and shape. They picked up the lights and really made my tree sparkle. I'd consider giving some as a present too. I have to admit that I was disappointed when I got these in the mail and they were flat on one side. Overall they were not what I expected. I originally saw these a year ago and couldn't decide if they were worth the price, so when I saw the great reviews I decided to give them a shot. I bought fours sets: 2 for myself and 2 for gifts. I have to say that I am a little (but not enough to return them) dissapointed in them. When you see them in the box they don't look all that nice and it is really difficult getting them out of the plastic holder that they are in. But they did have a nice sparkle when held up to the light, so I think that with Christmas lights behind them they will look great. I do like that they come in all different sizes, but I won't be able to use all of them on the Christmas tree as a few are too big and others are too small. But they will look very pretty hanging on a garland draped on the mantel. I wasn't too thrilled with the packaging: the box smells really musty and it leaves a gritty oily feel on your hands and the ornaments. I think that before I give them as gifts I'm going to clean them with glass cleaner and find different packaging. I have never had a problem with shipping from overstock and not one icicle was broken. 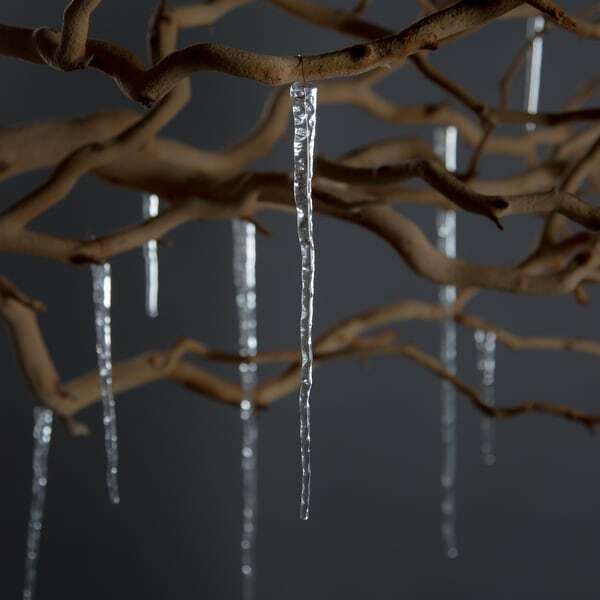 These icicles are perfect in detail (minus the dirt sometimes seen in nature) and look absolutely beautiful on any tree! The various sizes and uniqueness of each icicle add so much to our Christmas tree. I've been collecting crystal icicles for years and these are the most realistic I've ever purchased. I've GOT to get more of them! These icicles look great on my tree. I loved that they are so natural looking and come in varied sizes. Would definitely buy again. I just received my glass icicles and I can not wait for Christmas. They are gorgeous. There’s a variety of sizes which is perfect. They came quick and well packaged. Not one was broken. I am about to order another set. My Christmas tree was decorated for Mardi Gras so it’s still up lol. I got to try them out with the lights. I may never take it down. Wish it came with strings or hooks to hang them. But that’s ok I will take care of that at Christmas. So realistic, great packaging, great quality! Really pretty and old fashioned. i used one set and was almost enough for my six foot tree but nothing bigger that. You would need more sets. I might get another set just cause I loved the look. Just a little twinkle from Christmas lights too. These are beautiful. I bought two sets and they made a huge difference on my tree- they really do look real. I think next year I will probably order another set or two they're so beautiful. I love adding icicles to my Christmas trees for some seasonal sparkle. WE LOVE GLASS ICICLE ORNAMENTS. "What is the circumference of each icicle at the base (not the fine tip, the wider end)? I want to know the measurement of the roundness of that base?" Thank you for shopping with us genuwine7898. The handcrafted touch of artisan skill creates variations in color, size and design. Have a great day. I don't know exactly but would guess between .75" & 1.5" since they are all different sizes. Few different sizes - but biggest is about 3/4"? "picture shows clear glass, description says they brown and black. Can you please confirm the color? Thanks"
"Is it possible to order a box of 11 inch only?" Unfortunately, this only comes as a set.